Picasso had arrived in Paris from Barcelona for the first time in October 1900, and returned in May 1901 determined to make a success of his Parisian career. At that time, Paris was the place to make it if you were a painter: it was the world's arts capital and the most culturally exciting city on earth. Picasso's first major exhibition was held at the dealer Ambroise Vollard's gallery at the end of June 1901. Many of the works in the Courtauld exhibition reflect a whirlwind of energy over a couple of months, producing as many as three works per day. Clearly, from the very start, Picasso proved amazingly prolific. These pictures reveal him absorbing the influences around him at a tremendous rate. Edgar Degas, Henri Toulouse-Lautrec, Paul Gauguin: he does them all. Toulouse-Lautrec is the obvious model for Picasso's scenes of Parisian night life such as "French Can Can." But most of all, you can see the impact of Vincent van Gogh. Picasso's biographer, John Richardson, has written that Van Gogh meant more to Picasso than any other artist in his later years. He even got a copy of the newspaper report of Van Gogh's ear-mutilation episode so he could frame it. 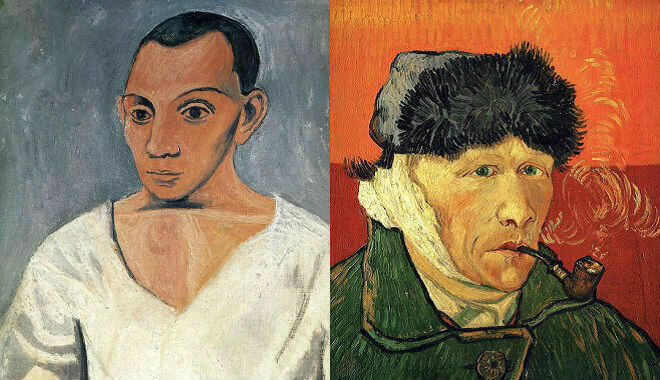 There isn't much sign of Van Gogh influence in Picasso's mature work, but in 1901 it's unmistakable. Mother and Child is clearly derived from the pictures that Van Gogh had painted of the wife and baby of Joseph Roulin, his postman friend. It's not hard to guess where Picasso had seen those paintings. Vollard had bought a magnificent array of works from the Roulin family given to them by Van Gogh, which resided in his gallery storeroom appreciating in value. The effect of seeing Van Gogh's Paintings is evident too in the thick brush strokes and piercing gaze of the terrific self portrait, Yo - Picasso (or "I, Picasso").